I use two computers, one is my main desktop in my home office and the other is my laptop that I travel around with. I’ve done this for many years now. But until I came across SugarSync, I had problem keeping files on the two computers synchronized. At first, I started using a hard drive or a flash drive and copying the important files that I needed for the week from my desktop to my laptop and back again when I got home. This was working okay for a short time, until I had more files and the files became much larger in size. Then it became a chore, like packing my suitcase is a chore. I would pack my suitcase, then move on to packing my briefcase, and then pack files onto my laptop for the week. As time went on I would try different methods of moving files between the two computers. I tried moving files via my home network and found this to be slow and cumbersome. Also, not all the files transferred between the two systems. One day, the hard drive crashed on my laptop computer while I was out traveling. I remember that day well, I was working just outside of Toronto Canada at the time my hard drive crashed. I was done! More than done, I was totally out of business. The trip was a waste of time and money not to mention leaving a bad taste in the customer’s mouth because the main tool I used was not working. It was broken! I swore to myself that I’ll never let this happen again. So, for a short while I started using an online backup service. It worked okay, but I had to ensure I had an Internet connection each evening. It wasn’t the perfect solution I was looking for and it didn’t work well when trying to synchronize files between two computers. It did a great job though of backing up the files on my desktop computer at home where I had a really good Internet connection. The service I used is called I-Backup. Although I don’t use I-Backup anymore myself, I still recommend it to a lot of my clients. It is a very good idea to have an off-site backup solution for your small business, which is automatic. I’m a huge fan of automation and if I can automate a repetitive task, you can sure bet I’m going to do it. I-Backup is fully automated, it’s one of those few applications you can find for a PC that you can load, set and forget. It’s autonomous! I-Backup is not the only online backup solution available today. There are many others such as Carbon Copy and Moze. 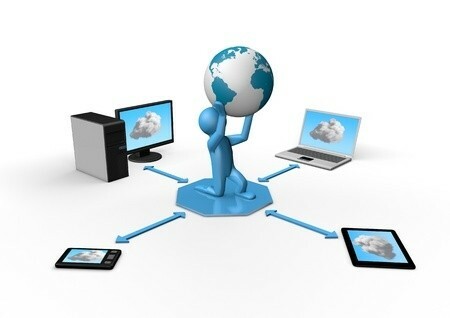 These backup services are also known as cloud based services, where you are backing up to the cloud. I don’t like the term “The Cloud”, it leaves something out from what’s really happening. You are backing up your systems over the international computer network system (commonly known as the Internet) to somebody else’s computer/server someplace else. That’s the cloud! But as stated earlier, using an online backup service wasn’t the ideal solution to my problem. I needed a solution that would easily copy files keeping them synchronized between my desktop and my laptop. One Christmas a few years ago, my wife bought me a Kindle e-reader. I’m sure I’m going to talk about the Kindle e-reader in one of my blog posts sooner or later as it’s one of my favorite travel gadgets. One of the first books that I bought and read on my Kindle was the Four Hour Work Week by Tim Ferris. In his book he talked about the automation of repetitive tasks, and he talked about online file sharing services. He mentioned two in particular, Dropbox and Sugarsync. I use both Dropbox and SugarSync, but find that SugarSync is more suited to my personal needs of syncing files between my laptop and desktop. If you have a lot of files like I do, then setting up Sugarsync for the first time on a PC takes some time. It’s not so much time spent configuring the software, but it’s time it takes for SugarSync to synchronize all of those files with the service in the cloud. After the initial setup, Sugarsync is fully autonomous. In fact most of the time I don’t even realize it’s running on my two computers. What’s really cool about it is after I finished either creating or editing a document or file, it automatically sends that file up to the cloud. And if I’m not connected to the Internet, it just simply waits until the next Internet connection then uploads my work. When I log on to the other computer and connect to the Internet, those files I worked on or edited automatically download synchronizing both computers. It does this both ways, so no matter which computer I’m working on at the time it automatically uploads my files and downloads them to the other computer automatically. Furthermore, Sugarsync keeps the last five revisions of my files I have been working on. This is a very nice feature because a number of times I’ve worked on a document or file and then wish I could revert back to the original. With Sugarsync you can do this. Plus it acts as an online backup system too, ensuring that I’ll never be stuck again on the road without a computer with my files. You can also access your files online at the SugarSync website. It also lets you create links to your files so you can Email them to others. This is ideal for emailing large files which cannot be attached to the email its self. It’s also ideal for those who use Virtual Assistance like I do. My Virtual Assistant has access to my Sugarsync account and every day she is either editing or uploading documents that have been emailed to me. In addition to Web access, SugarSync offers a phone app too. I’ve found the phone app useful in looking up things in documents on the go. One question I should answer “is Sugarsync Secure?”. The answer is yes, it’s very secure. But above all, using services such as Sugarsync allows me to have the ultimate portable office and saves me time. It also enables the concept of an Electronic Filing Cabinet which I shall talk about in a later post. Click here for the SugarSync webpage.